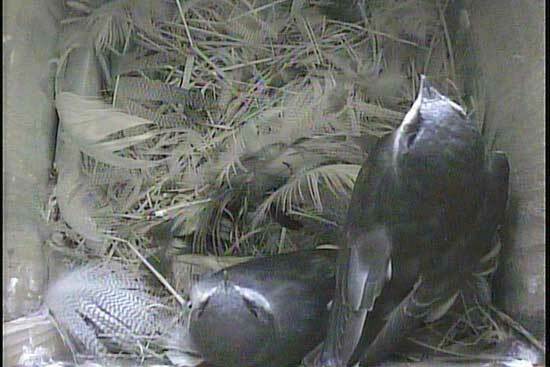 Live Bird Cam Streaming. Streaming Hummingbirds and Nest Boxes. 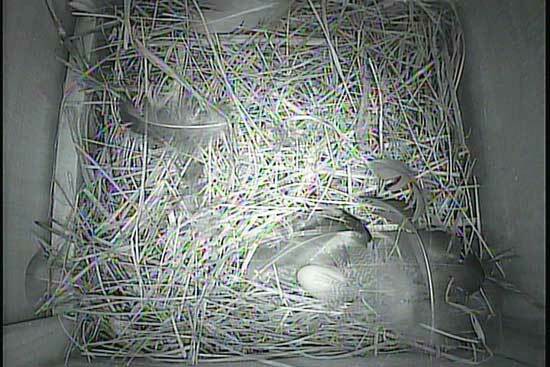 Welcome to our Live Bird Cam Streaming page. 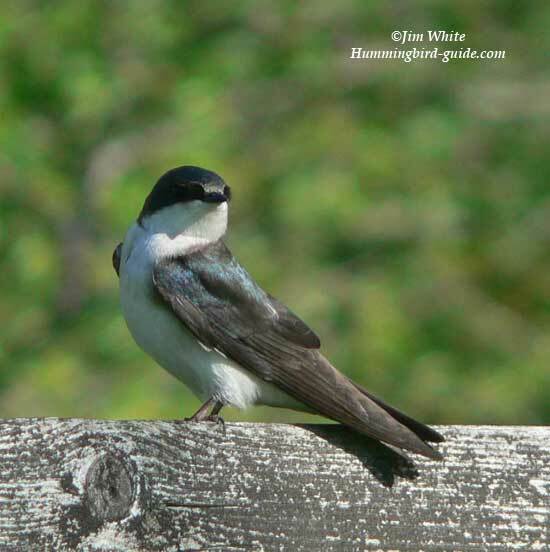 This is the 3rd year for this addition to the Hummingbird Guide site. 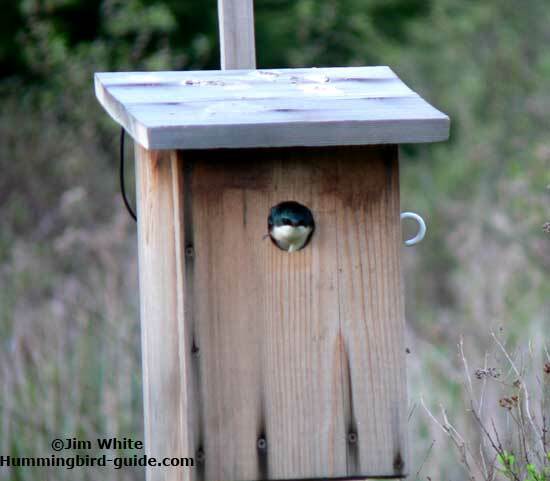 We started the 1st season off with a live stream from a bird box I built over the winter and placed in our yard in the Spring of 2015. We successfully attracted a pair of Black-capped Chickadees in our first year, as our guests, who built a nest and raised 6 chicks. We had the stream live during the day for you all to enjoy and witness the stages of nest building, egg laying, hatching, feeding and fledglings leaving the nest. You can see a history of this Chickadee family here. 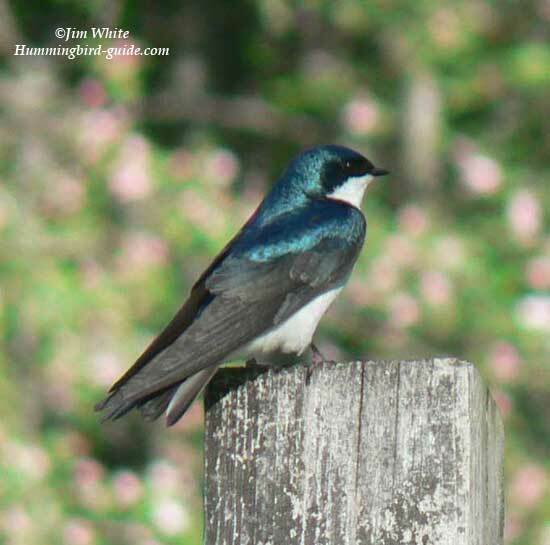 Last year we attracted a pair of Tree Swallows to our nest box and watched the full cycle of nesting to the day the chicks fledged the nest. This year (2018) we have a pair of House Wrens in our nest box holding our BirdCam. They started their nest building chores on Tuesday May 9th. On Thursday May 17th they spent the whole day constructing the nest. Flying in and out of the box with mostly twigs for the nesting material. They also gathered some of the Nesting Material from the 2 cages of material we have hanging in our yard. 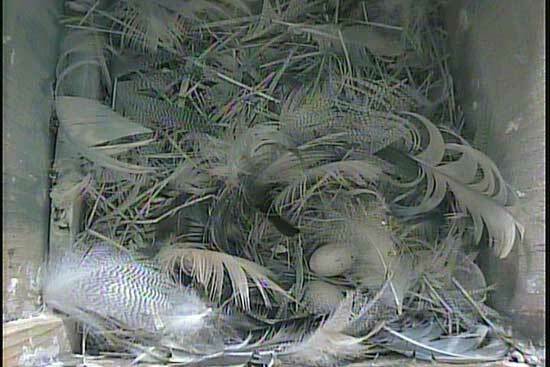 So.........Stay tuned and check back often to watch the progress of nest building, the eggs, the hatch and the chicks growth until they fledge the nest! At this stage, we will be broadcasting only when there is activity which usually is in the morning hours. 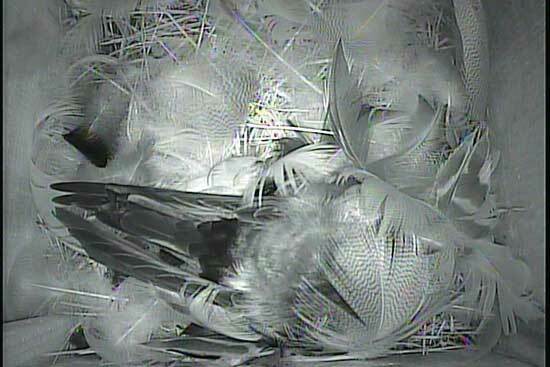 They are still in the nest building stage and are most active in the morning hours. As the activity increases, the hours of broadcasting will increase. 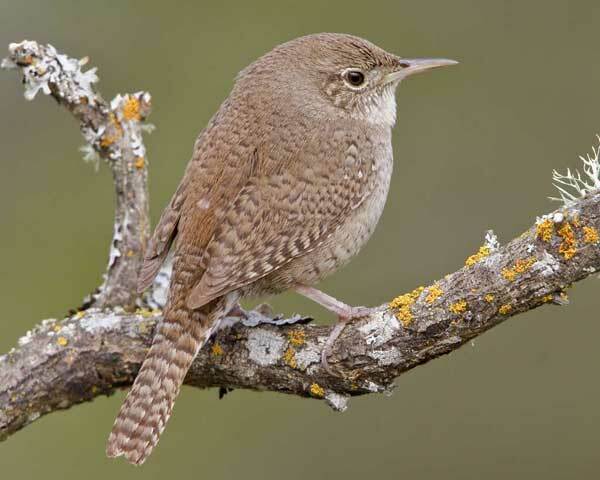 House Wrens have very distinct, rich sound which is easy to identify. Here is a video of their bubbly sound. Saturday, May 19, 2018: The first egg was laid. 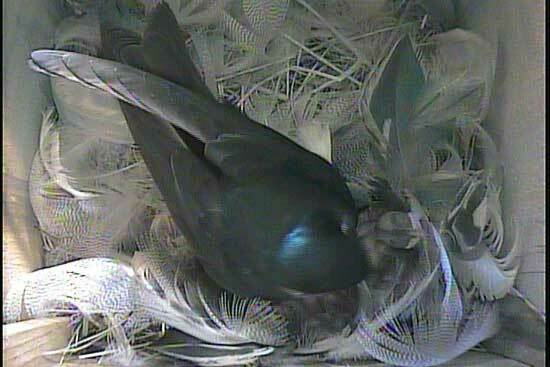 She covered the egg with feathers to keep it warm while she was gone out of the nest box. Friday, May 25, 2018: The Wren laid her second egg. 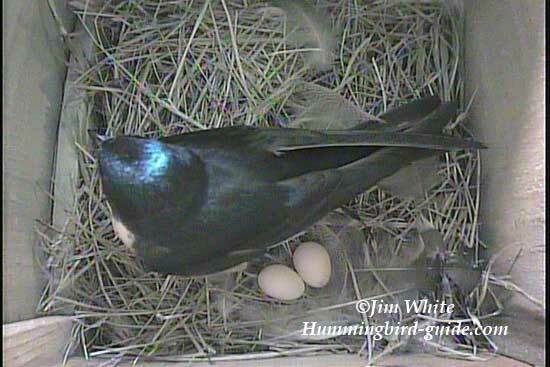 She has been sitting on the eggs each night and started periodically during the morning hours today. 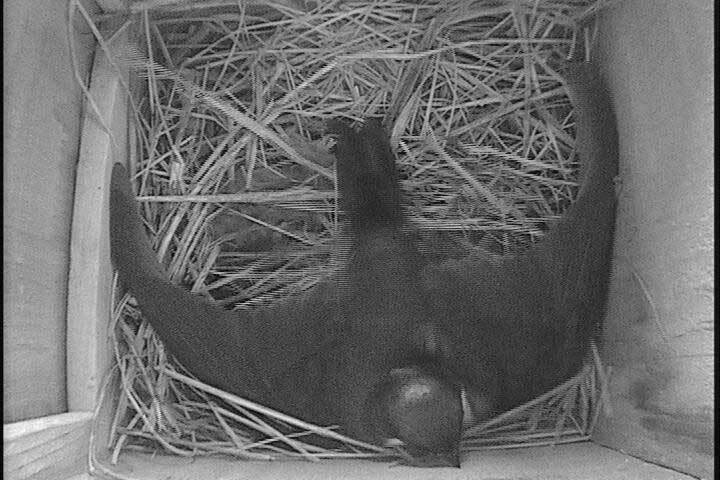 The nest is so deep and dark it is hard to see her in the nest when she is in the box during the daylight. 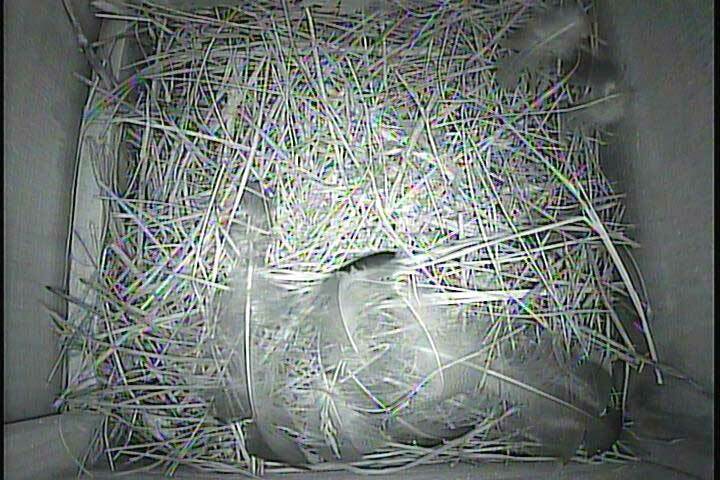 Because of the infrared diodes of the camera it is easier to see the nest during the dark hours of the night as the infrared feature kicks in. 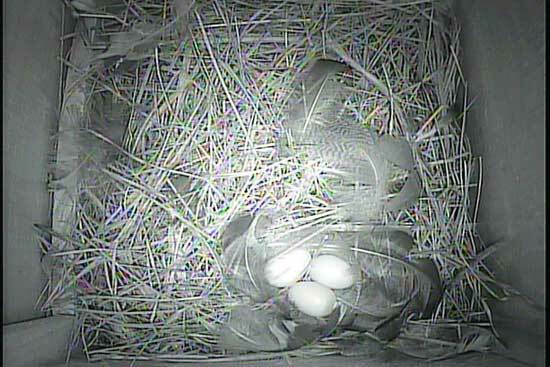 Saturday, May 26, 2018: The third egg was laid overnight. Sunday, May 27, 2018: The fourth egg was laid. Monday, May 28, 2018: The fifth egg was laid. Tuesday, May 29, 2018: The sixth egg was laid. Wednesday, May 30, 2018: The seventh egg was laid during the day. 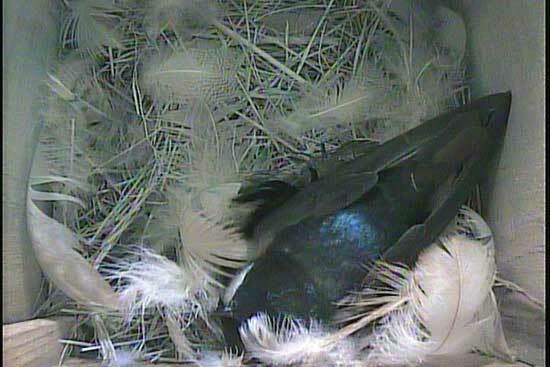 She is sitting on the nest more and leaving the nest box for brief periods. Monday, June 11, 2018: The chicks hatched and Momma is busy with here feeding chores! Friday, June 29, 2018: The chicks fledged the nest box today! They are on their journey to maturity to raise their own brood. 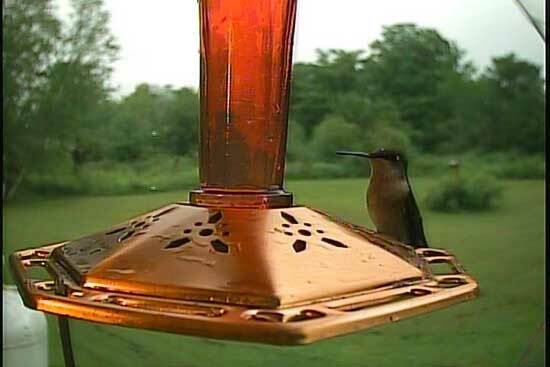 We will be moving the BirdCam to one of our hummingbird feeders. Unfortunately, "Ustream" was purchased my IBM and as of August 1st they will be ending the free streaming service. Their monthly charges to use their service are very expensive and we will not be able to afford the fees. We will be searching for an alternate streaming service to bring you the Live BirdCam. NOTE: The "Nature Video Camera" used for our live streaming is an infrared camera so in the evening or on dark cloudy days you will see a more black & white picture. During brighter conditions in the day the picture will have more color and detail. ANOTHER NOTE: We use "Ustream" live streaming service for our video. You will see both text and video ads because it is a free service and this is the exchange to keep the service free. Otherwise, we would not be able to offer this to you. We use the "Hawk Eye HD Nature Cam" for our live streaming. 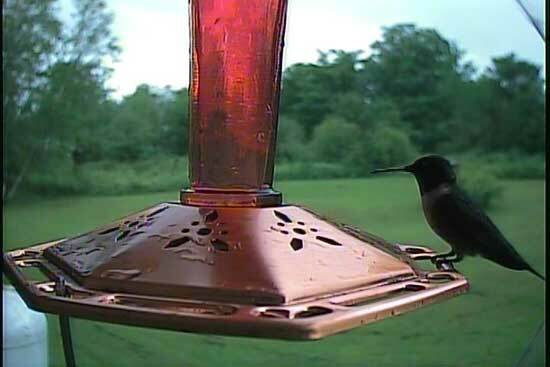 Access Our Live Streaming BirdCam with our App, the "Hummingbird Tracker"! 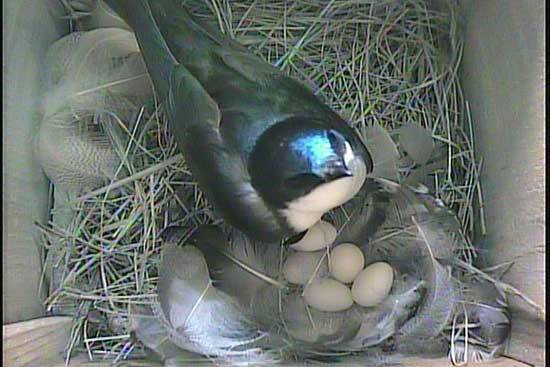 The first half of the Summer of 2016, we had our BirdCam inside a Tree Swallow nest box until the chicks fledged the nest on June 30th. As you can see below they are truly beautiful birds. 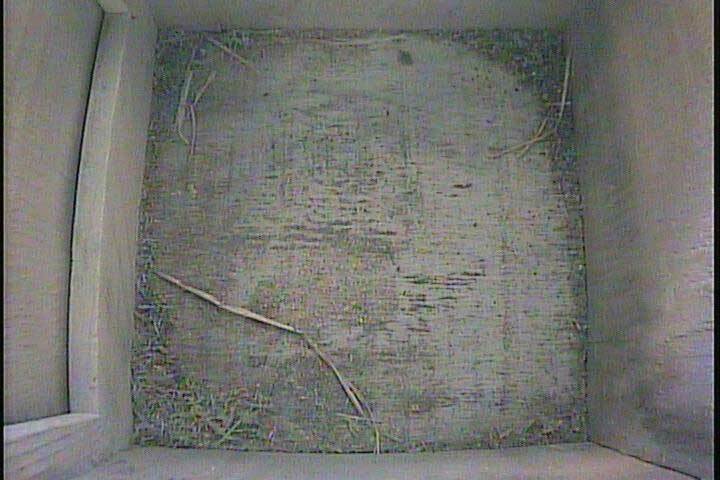 Below is a progression of photos inside the nest box from the start of nest building, eggs hatching, the chicks growth until the end when the chicks fledge the nest. 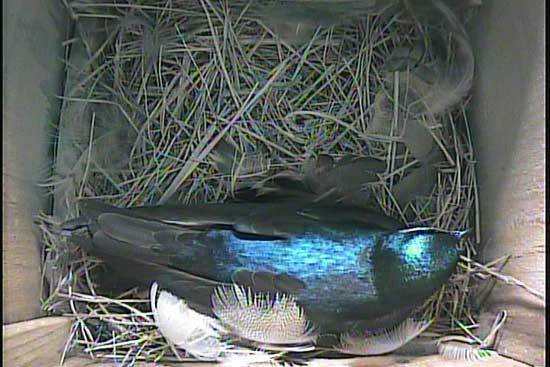 April 28th - The First Sign of "Nest Building". May 24th - Female Occupying the Nest on a cool morning. June 9th - Covering herself with feathers in the evening to stay warm for a long cold night. It has been extraordinarily cold the past 2 days. No chicks have hatched yet. NOTE: The Incubation period is usually about 14 days. We're not sure exactly when she started her incubation, whether it was after the 1st, 2nd, 3rd, 4th or 5th egg was laid. Therefore, the first egg should hatch anytime after June 7th (14 days after the first egg was laid). 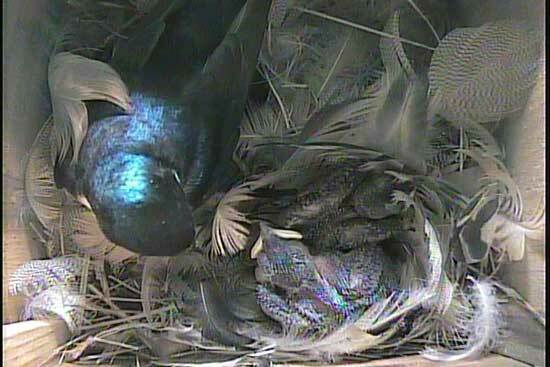 June 11th - Two Chicks hatched in the morning hours. 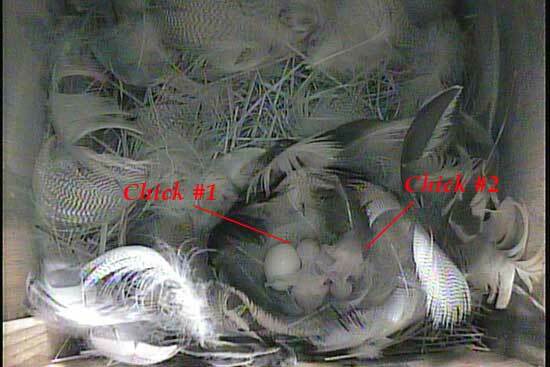 3rd Chick hatched later in the day. June 12th - Three Hungry Chicks in the Morning. June 13th - Unfortunately, the temperatures dropped to unusual cold conditions for this time of year. Only 2 chicks survived the cold. 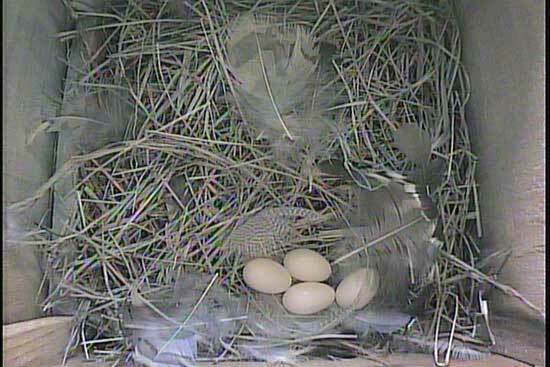 There is still 2 eggs that didn't hatch due to the extreme low temps over the past 3 weeks. 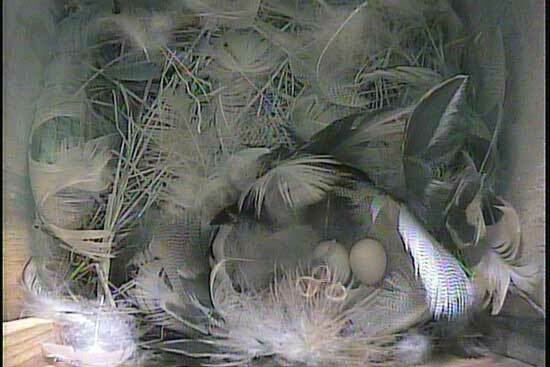 June 17th - Chicks are 6 days old and developing feathers. 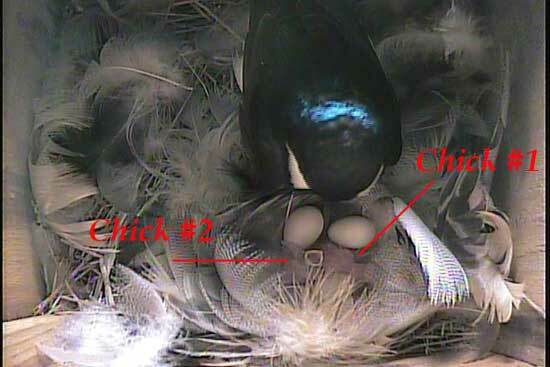 June 21st - Chicks are 10 days old and showing the beautiful Teal Color. June 24th - Chicks at 13 days old. Feathers are growing fast. 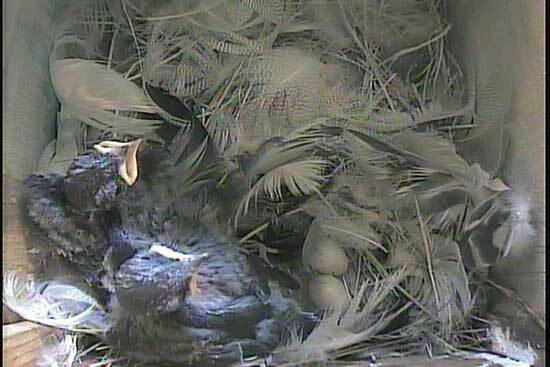 June 30th - Chicks are 19 days old and fledge the nest today. 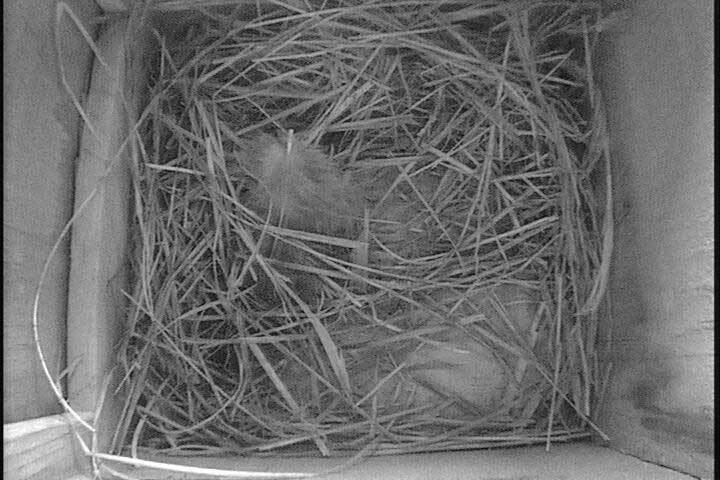 June 30th - Chicks have fledged the nest box and the 2 unhatched eggs remain. Nature Can Throw a Punch! NOTE: Our Live Streaming BirdCam was down for a few days. The Feeder was taken over by Honey Bees. 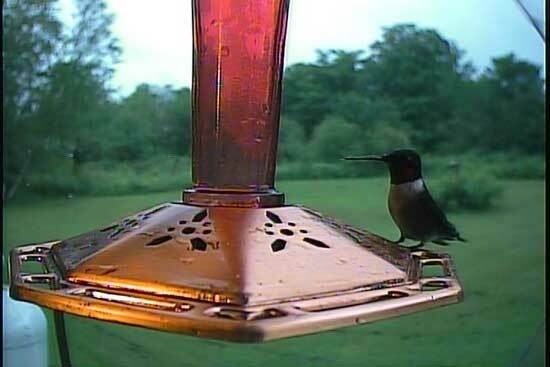 We are dealing with the problem and as soon as our Hummers are back able to use the feeder, it will be streamed again. Sorry for the inconvenience, nature has a mind of it's own! Update: We replaced the feeder with a "Tray Style Feeder" which is more Bee Resistant. We are now back online with the Streaming BirdCam! 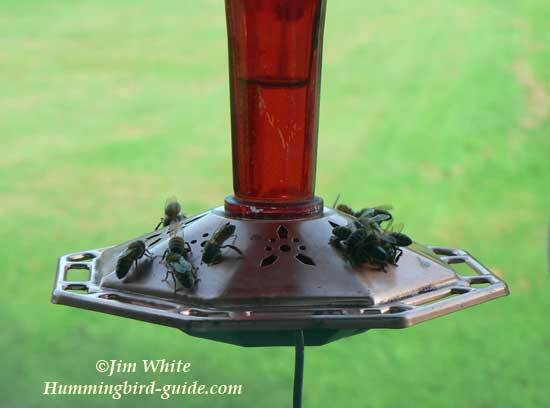 To learn more about how to deal with Bees, Hornets, Wasps or Yellow Jackets on your feeders, visit our Hummingbird Feeder Bees page. 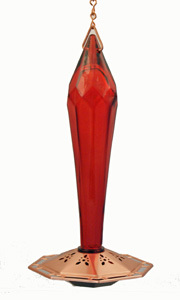 It is one of our hummingbirds favorites! 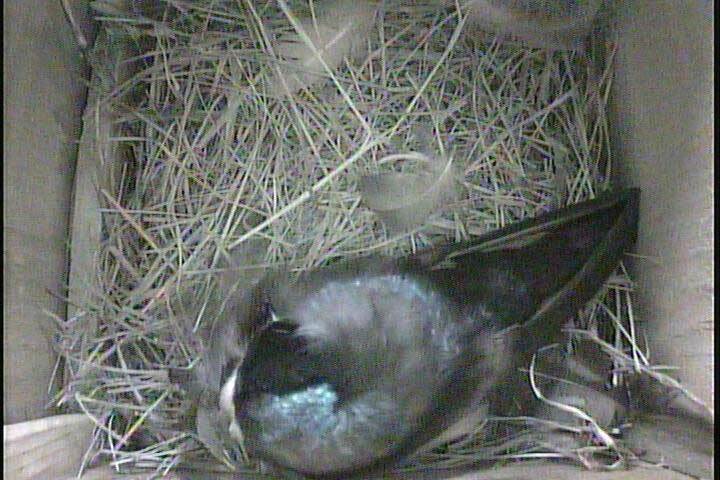 Our bird cam is now set up in a nest box claimed by a pair of Tree Swallows. Follow along as they build a nest and raise the chicks. After the chicks have fledged the nest box we will move the camera to one of our hummingbird feeders. 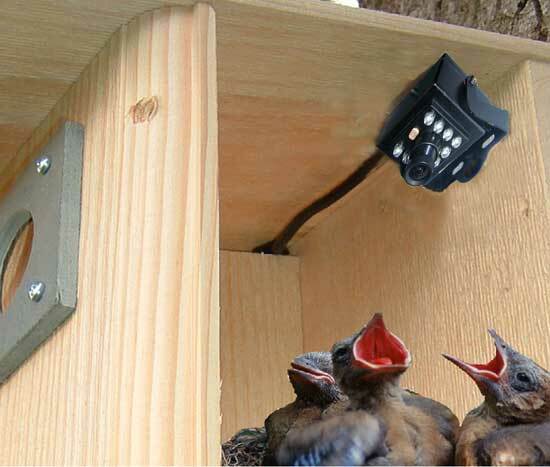 If you would like to observe your own bit of nature and maybe if you are so fortunate, find and stream a hummingbird nest, we have the this camera available in our store. Click the link below to learn more about the camera. 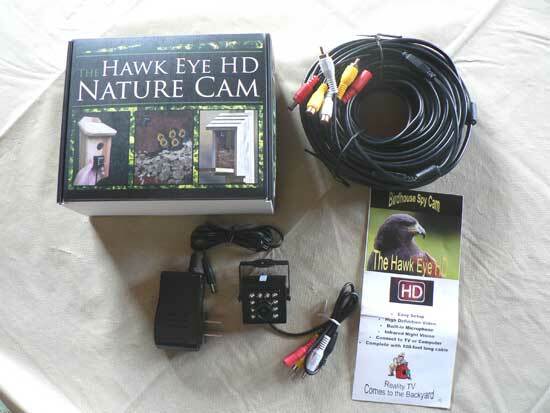 The camera used for our streaming is a "Hawk Eye HD Nature Camera". I will be doing a review of the camera in the future for those who are interested.